There was a whole lotta love throughout The Shire on Valentine's Day as the Sutherland Shire Libraries celebrated Library Lovers' Day. All Libraries were decorated with red and white balloons, hearts and chocolates and romantics were treated to book displays of romance novels and more! 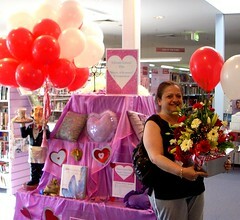 Menai Library ran a competition asking their customers to share their Secrets of Romance as part of the fun. Suggestions included trust, patience, lust, spa baths, laughter, oysters, showers, child free time, respect, chocolate, flowers mystery, holidays, money, lunchbox messages, thoughtfulness and some even suggested they couldn't remember romance! In the end LOVE won the day with 30 votes and the competition winner (see photo) was presented with a lovely bouquet. As well as creating a loving atmosphere in the library, Engadine Library customers were asked which book they LOVE the most, with one lucky customer receiving a bunch of flowers for participating. The most popular books nominated were The Lord of the Rings, Pride & Prejudice (no surprises with the first two! ), A fortunate life, Circle of Friends and The Power of One. You can see some more photos of Library Lovers' Day in the Sutherland Shire on Flickr. Thanks to all of you who visited us on Library Lovers' Day 2008! Could You be a Living Book?